Faster than the speed of litho with digital printing. Being fast doesn’t always give you a good name. Just ask your local boy racer. But when you need a print job done in a hurry, speed definitely has its advantages. Especially when there’s no compromise on quality. 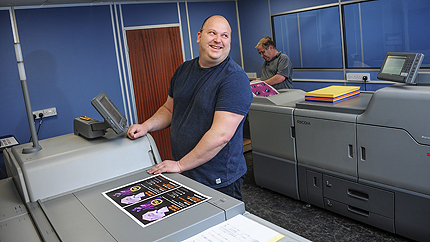 Which brings us neatly, as well as quickly, to Nationwide Print’s newest bit of kit – a Ricoh C751 digital printing press. Perfect for short runs, last-minute requirements and next-day turnarounds, this total digital solution complements our existing litho press and prints to the same superlative standards – just in double-quick time. In other words, we’ve turbo-charged our plant list and added some go-faster stripes for good measure. But while we’re smashing world records, we’ll still print with the same loving care and attention to detail you’ve come to expect from us. And remember, we’re kind to the environment too. Thanks to our clever solar roof, lots of the electricity involved will have been powered by the sun.